Another fine example of a Spanish Class Fast Finisher Bulletin Board! Receiving positive feedback about the lessons I create makes my whole day! A big GRACIAS to teacher Jessica who recently sent me a PHOTO of her Autumn Fast Finishers Bulletin Board! She has a cute theme of “Hoo hooo, What to do?” 🙂 A great way to incorporate Fast Finisher activities into her classroom! Did you know YOU can ‘earn’ the Spanish Class Winter Fast Finisher Bulletin Board set for FREE?? Showing your ideas and creative ways to set up your bulletin boards here on my blog can help inspire other teachers as they set up their own! Want to see more photos of how this bulletin board packet has been set up in other classrooms?? 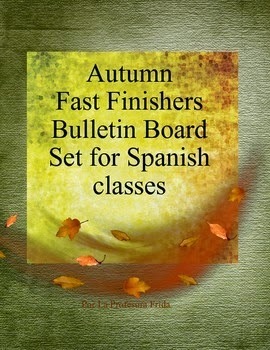 Follow this link: Spanish Class Fast Finishers, Autumn Style! Not sure how a Fast Finishers Bulletin Board works?? decide which cards you would like to display first. You can laminate the fast finishers cards and punch a hole and slip a key ring through the hole to make for easy hanging if you like. –Have an envelope (or a baggie) tacked onto the bulletin board with the “Ya termine” cards for students to use whenever they finish a task. Students write the important information for you on these cards, so you don’t have to go fishing for information! –Put a stack of the tracking sheets near the bulletin board or tacked onto the board in an envelope or folder (because not every student will participate, you don’t need to pass one out to each child). –Have an inbox tray (or a folder) for each class period tacked onto your Fast Finishers bulletin board. –Ask students to paper clip the “Ya Termine” card to their tracking sheet & anything that might need to be handed in with it all together. –Ask students to submit finished items in the envelope/folder with their class period on it. Then, once a week (or if you have a quick minute before or after school) you can check to see if any students submitted anything for you to check off. This shouldn’t take YOU a lot of time. The point is to keep your students learning with Spanish-related tasks while you work on other important tasks. Let them know that you plan to check things off only once a week, thus saving you from kids hounding you to check off their activities. Remember, you don’t need to “grade” anything. You can quickly mark their papers they hand in if necessary, just so they know if they’ve made a mistake. You can decide how long you want it to run. I’d suggest September & October. Then at the end, you can decide what kind of “prizes” to give out. Like for every 5 points earned, a fun sticker, or 10 points = a homework pass, or something like that. http://thestressfreespanishteacher.com/wp-content/uploads/2018/08/Eyes-and-Glasses-300x149.png 0 0 admin http://thestressfreespanishteacher.com/wp-content/uploads/2018/08/Eyes-and-Glasses-300x149.png admin2014-09-13 10:43:002014-09-13 10:43:00Another fine example of a Spanish Class Fast Finisher Bulletin Board!